birthday | hello it's ming. The first half of this semester at university has definitely taken upon itself to race full speed ahead and now I find myself embarking on my 7th week back with the prospect of Easter Break acting as my ‘pacemaker’. One more week before I can truly take a semi-break as I jet off to Singapore for a quick visit before my Lil’ Bro heads into the army! It has been a busy start to the year, to put it simply and any food spotting or life sharing has been limited to the world of Instagram. So…in a brief moment to breathe I thought I would make a quick visit to this space and share a little something which I always enjoy the most during my Singapore trip. Although we eat out 99% of the time and I could rave about the Singaporean food scene for an infinite amount of time, it is the family gatherings composed of homecooked meals and sitting around a relative’s living room which I miss the most when I am back in Sydney. 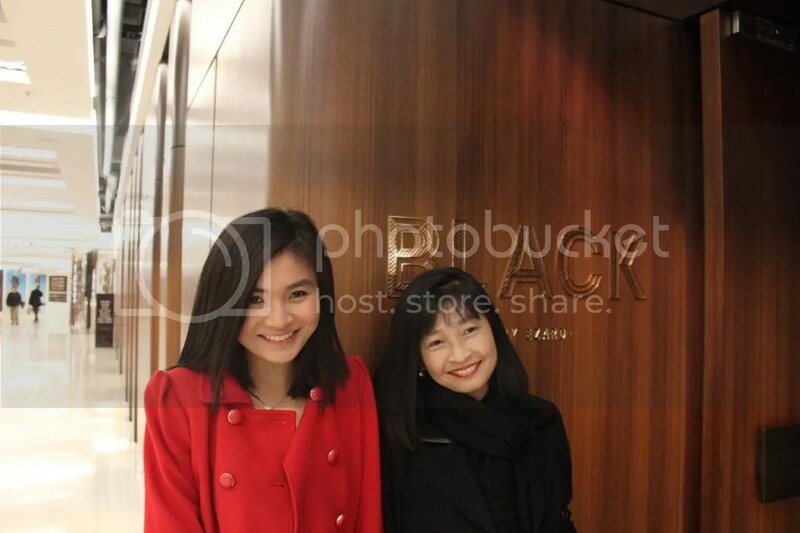 On my past trip, which was longer than usual I was able to celebrate my twin Auntie and Uncle’s birthday. My Si Yi (Auntie No. 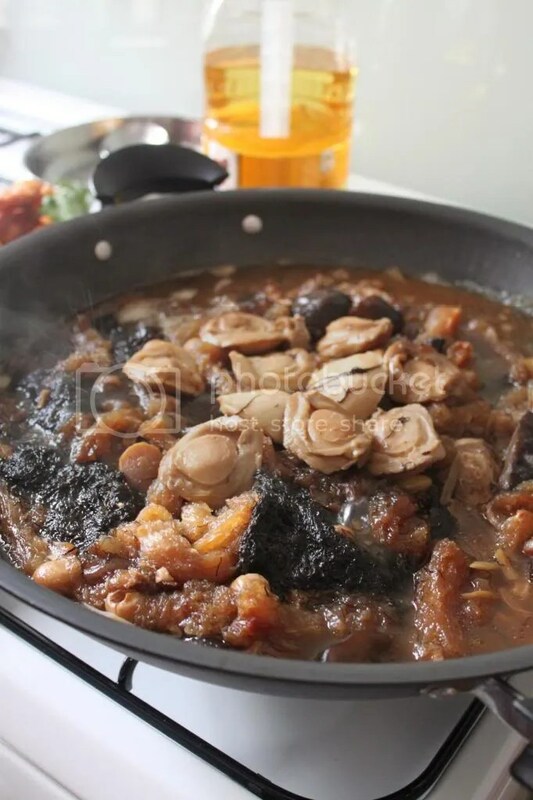 4) is no amateur in the kitchen, preparing ‘Peng Cai’, a Chinese New Year delicacy full of culinary delights such as abalone, with each holding a significant meaning. The birthday girl definitely deserved to be showered in affection after providing our stomachs with pure content. 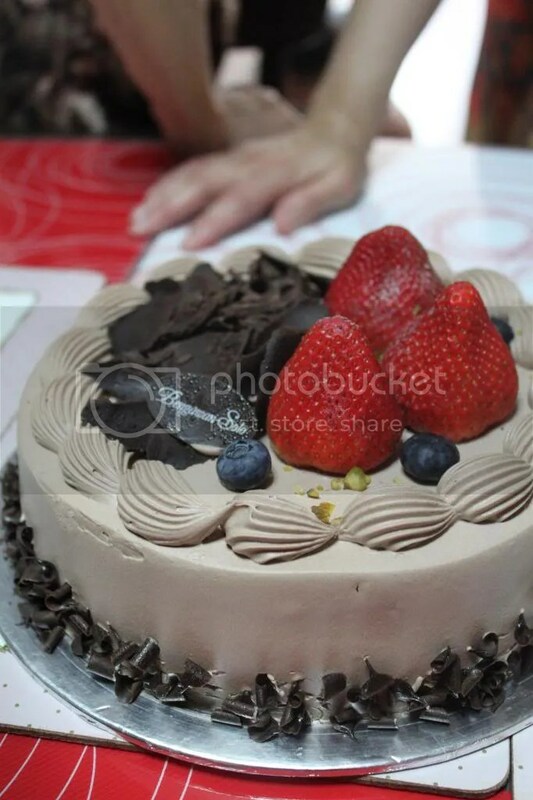 Blackforest Cake was featured as well as my newfound love, the Pandan Kaya Cake. 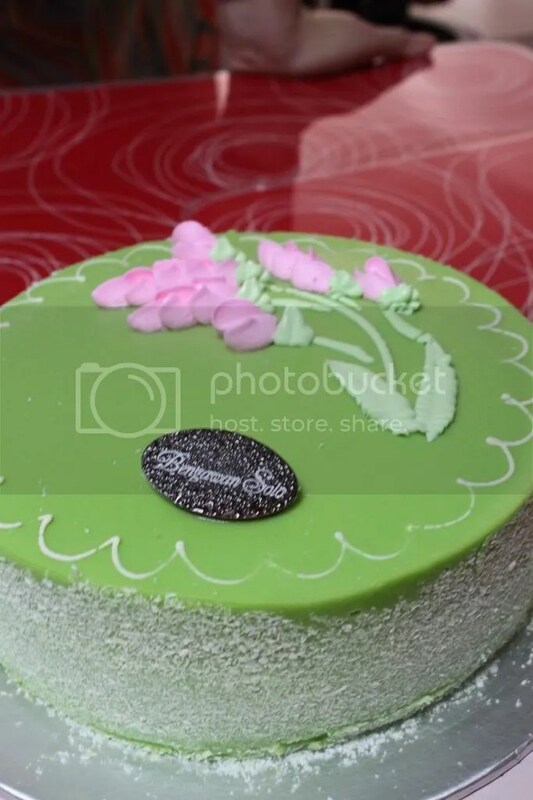 This entry was posted in Birthday, Cake, Chinese New Year, Family, Home cooked, Pandan, Singapore, Summer and tagged bengawan solo, birthday, family, food, foodie, helloitsming, holidays, meal, peng cai, Singapore on April 11, 2014 by helloitsming. With knowledge of the empty void of my WordPress has come waves of guilt and sadness I guess as a blogger of food I should say I’ve let my WordPress ‘feed’ ‘starve’?? On top of that there must also be an apology and some obligatory explaining for my prolonged absence from the blogging scene. Once again university charged at me with a number of challenges this semester. Every possible hurdle was presented, including an unexpected 2 day stint overseas! Thus came about the limited time to post and well… engage in any food-filled activities. Sadly and quite embarrassingly I embarked on an ‘eat to live’ rather than ‘live to eat’ mantra! Now being the end of my first semester of second year I have somehow reached the half way mark in my degree without even realizing – apart from when I looked in the mirror after exams to see dark rings around my eyes! It was a very stressful semester indeed, which ultimately led to a very rushed and crammed study period. Nevertheless, I await my results in complete fear but take comfort in my time to begin renewing and refreshing the life of this blog while I do the same personally over this break. I do have quite an overflow of photographs scattered between my phone and camera with a few eats that I had while slightly procrastinating and I can safely say that I have found some great places which I returned to numerous times and will continue to visit! Posts to follow! Time has certainly flown by as this blog has reached its 1 year mark, thus it is rather appropriate to bring it back to life with a Birthday post! This year we made a trip to Black by Ezard at The Star – another tick on my ‘to try’ list! The atmosphere there was rather special, as the floor to roof glass windows paneled across the restaurant to reveal a wonderful view of Pyrmont and the bright lights being channelled over from the CBD, which contrasted perfectly with the more intimate lighting of the restaurant itself. Now onto the main attractions of the meal! Funnily enough, all eleven of us ordered roughly the same dishes! 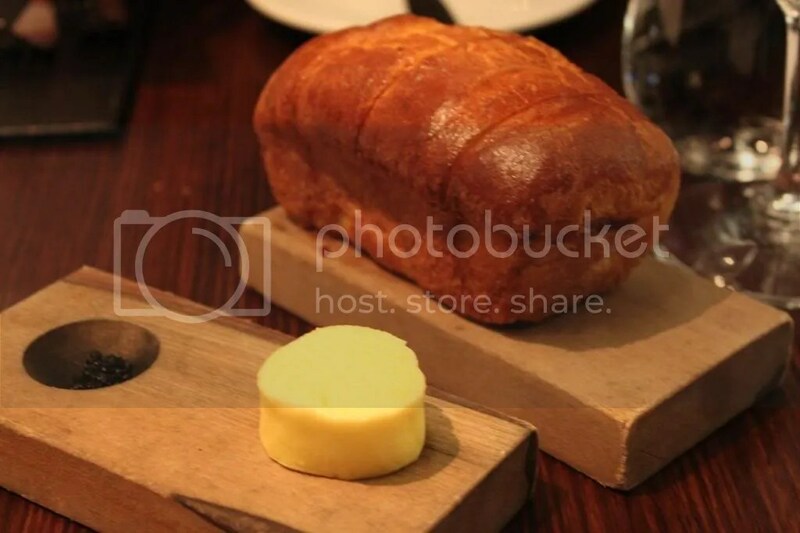 Appetite curbing devices in the form of brioche were presented and oh my they were divine! Perfectly crisp on the outside coupled with sweet cloud like innards. I still daydream about this brioche…mmmmmm…. 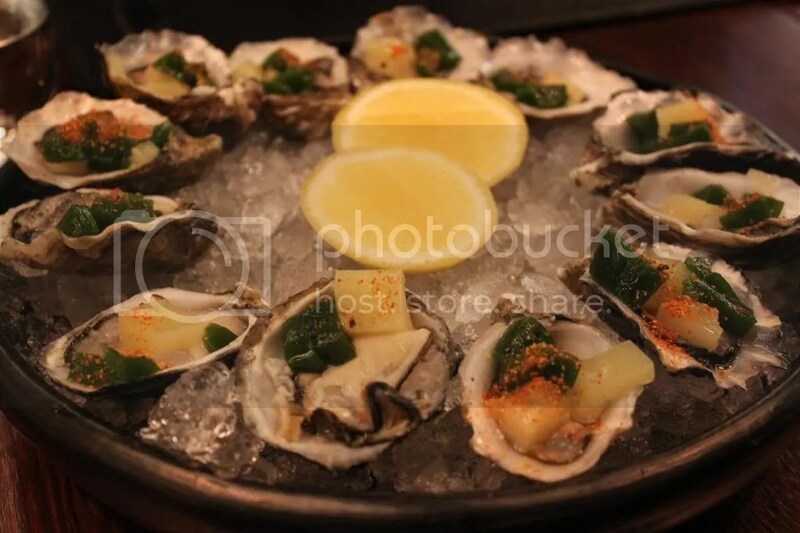 brioche…..
Out came a platter of oysters…how could I resist. Fresh and garnished with lemon and a great textural jelly component. I was rather confused as to what those black crusted spheres were, so I decided they had to be taste tested. 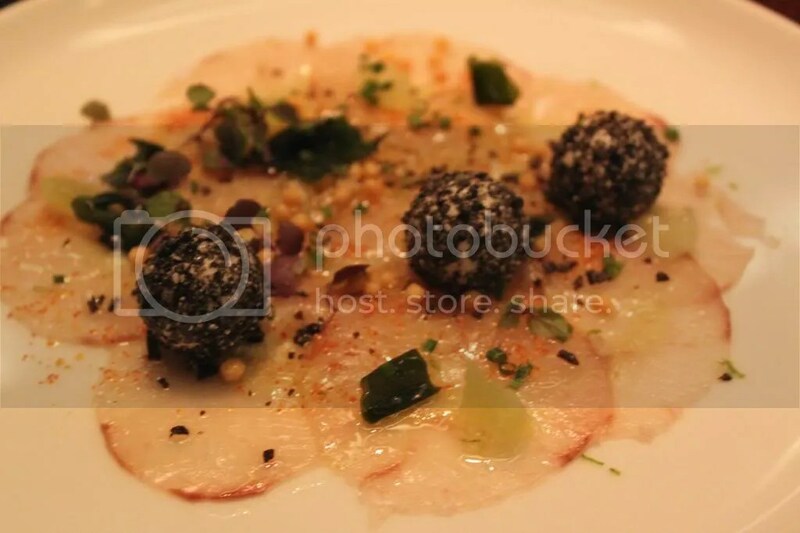 The suspects were Bocconcini rolled in what I suspected to be the special Black Salt, which complemented the dish more texturally as to not overpower the sashimi feature. The presentation was superb and such a genius idea! This entry was posted in Birthday, Chocolate, Dessert, Family, Fish, Fusion/Modern, Pyrmont, Risotto, Souffle, Steak, Sydney, The Star, Uncategorized and tagged birthday, black, black by ezard, chicken, chocolate, cuisine, delicious, dessert, dining, dinner, ezard, family, food, modern, pyrmont, restaurant, Risotto, seafood, steak, strawberry, sydney, the star on July 3, 2013 by helloitsming.